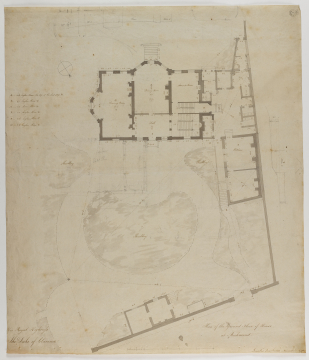 Perhaps drawn by a surveyor since, for example, the drawing has a compass point which is very unusual for Soane office drawings. The (three-storey) house is rectangular with a canted bow on each of two sides. The principal stair and service stair occupy the north-west part of the house that faces the kitchen so that the front door with a modest porch and leading into the hall is on the north-east side. Another door with an external stair, is in the south-west bay. The sections and the notes labelled ABCEFH relate to the hill site. The slight pencil addition pencilled-in by Soane is more fully worked out in drawing .